SolarEdge's HD-Wave technology inverter breaks the mold of traditional inverters. Using a novel power conversion technology that is based on a distributed switching and powerful DSP processing, the HD-Wave technology inverter is able to synthesize a clean sine wave that leads to a dramatic reduction in the magnetics and heavy cooling elements. This small and lightweight inverter enables simplified shipping and storing and one-person installation. The record-breaking efficiency allows more energy production for an improved ROI. Built-in module-level monitoring with internet connection through Ethernet or Wireless connections and features one integral AC/DC shutoff switch. 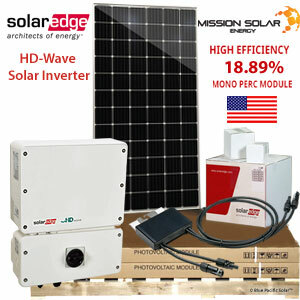 The SolarEdge kit with the power optimizer is a DC-DC power optimizer. The power optimizers, using an input control loop, perform per module MPPT [Maximum Power Point Tracking] and enable performance monitoring of each module. In an independent process, the power optimizers enable the inverter to automatically maintain a fixed string voltage at the optimal point for DC-AC conversion by the inverter, regardless of string length and individual panel level performance. ● Click the Concept ⇑ Tab Above, Videos & Documents to Learn More. Product Normally Ships in 2 - 3 Business Days After Funds Clear ● Line Drawing send via Email [PDF] 3 - 5 business days after funds clear. 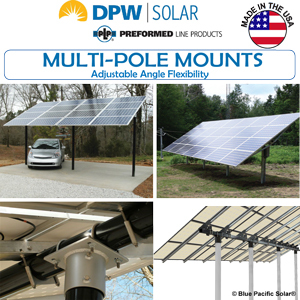 [See Optional Accessories & Related Items Below] Solar panel roof or ground racks are site specific options that are NOT included with the base package. Installation is Easy, Just Plug and Play. SolarEdge optimizer installation is easy. 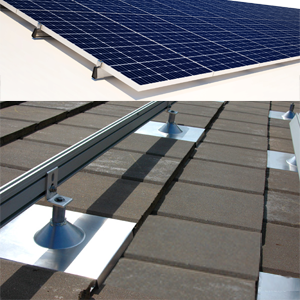 Simply single-bolt the SolarEdge power optimizer to your roof or ground rack. 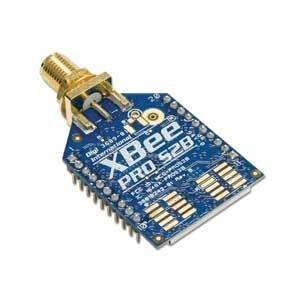 Then plug your Cable from the optimizer to the next optimizer. Finally connect the DC leads from the solar panels to the optimizer and you are rocking and rolling with the first panel of your grid-tie kit. The warranty extension is available with a one-time payment fee and must be activated within 16 months of inverter shipment. Should you choose to purchase the extended warranty, you would contact SolarEdge directly after you install your system as the warranty is directly between you the consumer and SolarEdge. Cost to extend to 25 years range from about $300.00 to $750.00 depending on the size of inverter. Production = 1,350 kW Per Month ● Assumptions: 375 Watt STC Panel Rating [Factory Rating; No Derate Factors Applied] @ 5 Sun Hours (Average). 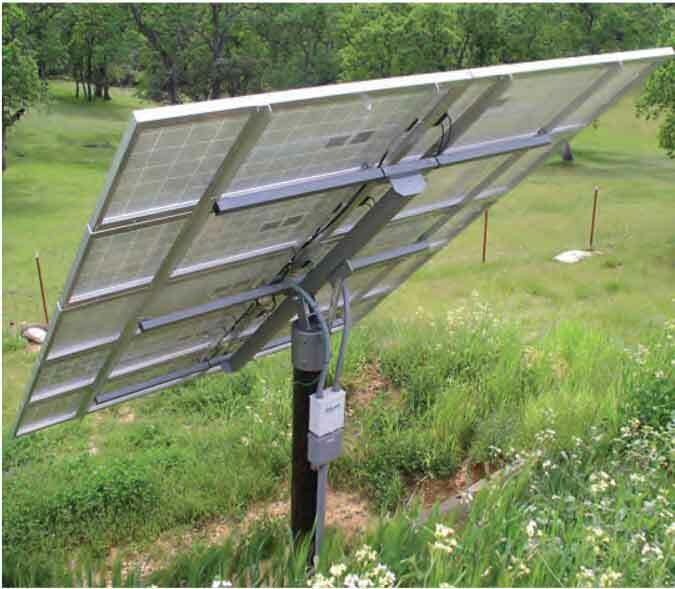 System owners enjoy the benefits of SolarEdge technology, which allows maximum power production through module-level maximum power point tracking (MPPT), optimal roof utilization through constraint-free design, and enhanced maintenance and accurate troubleshooting through module-level monitoring. Another benefit is the DC shutdown for installer, homeowner, and firefighter safety through SolarEdge's SafeDC™ mechanism. More Power = More Savings on Your Energy Bill. The inverter, which takes DC energy from the roof panels and converts it to AC, is the brain of the solar system. A smarter, optimized inverter can be the key to generating more energy than with other systems. How does this work? In traditional systems, installers connect solar panels in ‘strings.’ Just like with Christmas tree lights, where one failed bulb knocks out the other bulbs, one underperforming solar panel will lower the performance of an entire string. With an optimized inverter, power optimizers connect to the solar panels to enable them to perform independently. This results is more energy for your home. SolarEdge’s HD-Wave inverter is based on a novel power conversion topology that significantly decreases inverter size and weight, while also improving efficiency. Weighing in at only 25.3 pounds and measuring 17.7H x 14.6W x 6.8D (including safety switch), SolarEdge’s HD-Wave inverter is the smallest and lightest inverter the company has ever manufactured, which enables faster and easier installation. The innovative inverter complies with safety and revenue grade standards including: integrated arc fault protection; integrated rapid shutdown for NEC 2014 and 2017 690.12; and optional revenue grade data, according to ANSI C12.20 Class 0.5 (0.5% accuracy). Consistent with all its other inverters, SolarEdge’s HD-Wave inverter includes 25-years of free module-level monitoring and 12-year standard warranty. By adopting a holistic approach to innovation, SolarEdge designed the HD-Wave grid tied inverter to support enhanced product reliability by using film capacitors instead of electrolytic capacitors. To enable faster commissioning, the HD-Wave inverter has automatic power optimizer identification and string assignment detection. In addition to offering standard SolarEdge design flexibility, the HD-Wave inverter enables 155% DC/AC oversizing. Line drawing questions or just stuck? No worries we have your back and will be here to help whenever you have questions about your purchased Kit. For orders larger than $2,000.00 a Technical Sales Team Group Captain will be assigned your account. Your Technical Advisors job is to coordinate all parts and pieces of your order and to work with you throughout the process. This support helps because we will be providing you with a single contact point to call with your questions. 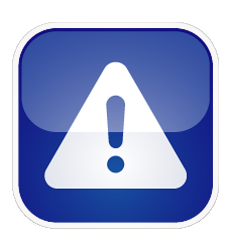 Your technical support contact does not replace the maufactures warranty technical support. DIY means you accept the responsiblity of reading and following the line diagram and other installation documents prior to tackling the installation. 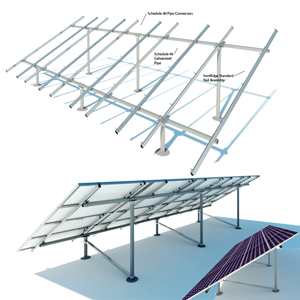 NOTE: For detail support after installation customer must be willing or have the ability to connect to the SolarEdge monitoring platform. 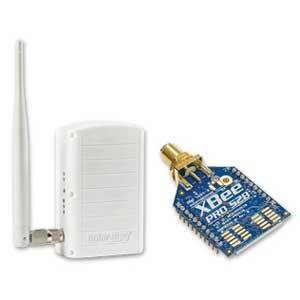 The monitoring platform software is free but requires and WiFi connnection to the inverter via RS485, Ethernet or ZigBee (optional) or cellular (optional) . 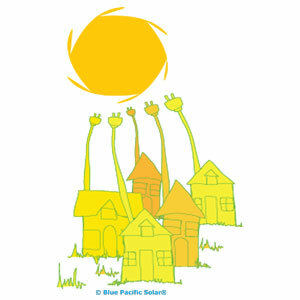 Blue Pacific Solar® SolarEdge Kit is featured with Mission panels. Mission Solar Energy, proudly assembled in the USA, is headquartered in San Antonio, TX with module facilities onsite. Mission Solar hardworking team calls Texas home and is devoted to producing high quality solar products. Our supply chain includes local and domestic vendors. 25 Year Warranty, UL Listed. 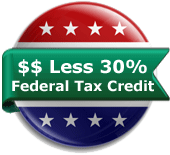 The federal solar tax credit, also known as the investment tax credit (ITC), allows a taxpayer to claim a credit of 30 percent for a qualified system located in the USA and that is owned and used as a residence by the taxpayer. Related Items: Racks; Roof, Ground, Top-of-Pole or Adjustable Tilt Ground.